You create a macro in Excel by running the macro recorder or by using the Visual Basic for Applications (VBA) editor. After you've created your macro, you'll want to save it so you can use it again in the current workbook or in other workbooks. Save it as a macro-enabled workbook (*.xlsm file type) by clicking No. Save it as a macro-free workbook by clicking Yes. In the Save As box, in the Save as type list box, choose Excel Macro-Enabled Workbook (*.xlsm). 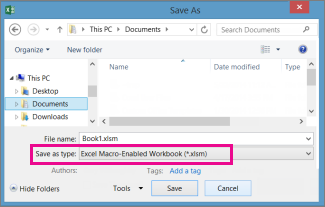 To make your macros available every time you open Excel, create them in a workbook called Personal.xlsb. That’s a hidden workbook stored on your computer, which opens every time you start Excel. See Create and save all your macros in a single workbook to learn how to do this.